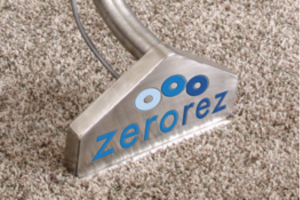 We believe that a healthy home starts with clean carpets, and nothing cleans more thoroughly or protects your investment better than the revolutionary, patented, Green Process offered by Zerorez. Our cleaning system does not use harsh detergents or toxic chemicals to clean, but uses instead a revolutionary, non-toxic water-based cleaning agent as its cleaning fluid, called “Empowered Water®.” We don’t leave any dirt-attracting residues behind (thus Zero Residue®). So What is Empowered Water®? Empowered Water is exclusively used by Zerorez and is applied to your carpet fibers by a patented high-pressure, controlled spray system that loosens embedded dirt and removes it through our powerful and patented extraction wand. Your carpet is clean with Zero Residue® and the dry time is dramatically reduced because we don’t need to flood your carpets with water, unlike all other carpet cleaners. There is no one that cleans like we clean. If you want the best and highest quality carpet cleaning for your home or office, you can’t beat our patented cleaning process! Give us a call at 405-606-7030 or visit our website at www.zerorezok.com to learn more about our carpet cleaning, upholstery cleaning, tile & grout cleaning, and more.